Spring is coming, and your mulch needs a touch up! Who loves the smell of mulch? If you love the smell of mulch you must be a spring person! The fresh aroma of mulch can be disgusting but quite nice at the same time. The smell of mulch is the symbol that spring is finally here after a long winter hibernation. Landscape companies and your neighbors are going to start buzzing around Home Depot, Lowe’s or a local garden center to spruce up landscape mulch. Mulch is not just used for a aesthetic look, although a new dark mulch blanket looks stunning against vibrant plant colors. Mulch has plenty of benefit to your landscape. A long time favorite that mulch has to your landscape is that it keeps those pesky weeds out of the garden bed. The mulch chokes them out with a thick layer and also kills the weeds because there is no light source for the weeds to keep surviving. Another great benefit of mulch is that it retains the moisture to your landscape bed. That means you don’t have to add as much water to your plants in comparison to only having plain dirt or a rock/gravel bed. Less work – score! Curious for more reasons why mulch is a great addition to your property? The soil temperature! Mulch controls your soils temperature by acting as a insulator. Not only does it work great in the winter, it also works great in the hot summer heat. Mulch does a great job of keeping the soil temperatures lower for a long period of time in the summer months. In the winter it controls the temperate in the cold by retaining the heat. Mulch is also excellent at preventing soil erosion. When the rain starts to pour, if it hits the soil directly it may wash away a significant amount. That is no good. Soil is heavy and expensive to add more. Mulch will prevent any soil from washing away by acting as a barrier from the rain water. Although mulch has incredible benefits to your landscape, there are different types of material to use as a mulch. What is your favorite type of mulch? Let us know in the comments below! Have you been strolling through your local Bucks County, PA garden center this fall? If so, you probably spotted garden mums. Specifically, the plant, chrysanthemum! 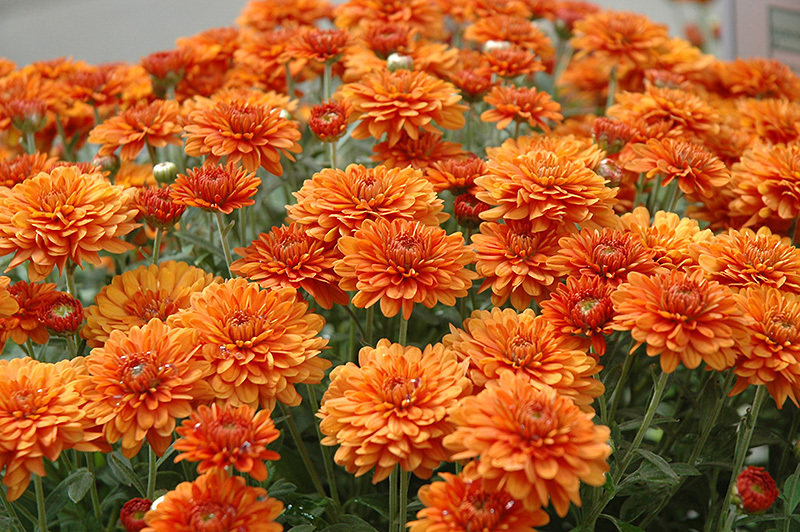 Mums are a wonderful plant of the day selection because they are perfect for fall. The plant has bold autumn colors including red, yellow, orange, pink and more. Read more below for care information! Sun: For the most beautiful blooms the plant needs direct sunlight. If that is not possible, the National Chrysanthemum Society states that three hours of full sunlight daily will be sufficient enough. Be careful not to give them too much shade. This will cause less blooms and limping stems. Soil: Make sure the soil does not become too dry. Mums cannot handle extreme drought conditions. The best way to see if your mums need water, is to reach and feel the dampness of the soil. If it feels dry, it needs water. If it feels damp, you can probably skip. Be sure to water the roots directly and not on the blooms. The soil should be well drained and not too clay-like. If your soil has too much clay you may have to amend the soil. Watering: Generally one inch of water per week should do the trick. Depending on the weather. With more hot weather, water more. WIth more rain, water less. Once the ground becomes cool, you can stop watering. Mulch: 2-3 inches of mulch should be added around the plant. The mulch will act as a insulator and retain moisture. Overwintering: The mums need to be established to overwinter properly. If you install the plant in the spring, by the time to cold weather hits, the roots should be hardy enough to survive harsh weather. You will need to cut back the plant so that it is slightly off the ground.This will make sure that your plant grows healthy next year. Got a favorite colored mum? Let us know in the comments below! Zoysia grass can make your lawn look full and beautiful. But if not properly maintained along with cool weather conditions problems can arise. Zoysia builds up between the blades and makes the grass look tan. The biggest problem with this is the methods to remove the thatch build up. The easiest way is the most dangerous and illegal in some states and townships. Homeowners will burn the grass. It sounds crazy but it’s very common in places where it is allowed. The thatch is burned away and the ash goes into the soil and promotes new growth. The roots are resilient enough to come back and give life to new beautiful looking grass. The best time to burn the grass is in early spring before the grass leaves dormancy. Zoysia grass doesn’t require as much water as other grass types which is good if you live in a dryer area where rainfall is a hot commodity. Zoysia is commonly seen down south where the grass goes dormant rather than dying when harsh weather conditions occur. When this dormancy happens it will turn Brown or tan until it leaves dormancy. There are many different species of Zoysia and it can be found mainly across Asia as it is native to Asia and also Australia. I hope this brief article expanded your knowledge about Zoysia grass. Is It Risky to Choose a Small Company? We also value our clients opinions. Our equipment is maintained weekly and if for some reason something breaks down we’ll find away to finish the project. We do not pick favorites!! Our clients are more to us than just a paycheck. We like to get to know our customers and what they would like us to change for next time. If you ever have a problem with a job that we did then just give us a call or shot us an email and we’ll answer the same day. We treat our clients yards just like their our own. By that I mean we make sure we clean up our trash and leave your property cleaner than how we found it. We also write blogs to help our customers understand why we do some things the way we do them. Not only that but to help them understand what’s best for their landscape and the best way to take care of it. and its not because we want to look like an eggplant! We want to stand out! When do you ever see a landscaper wearing a purple uniform? Never! That’s exactly why we chose it. People can recognize our company from driving by 35 miles per hour past us. It just takes a glance of an eye to see that we are wearing purple. It begins to make a connection with people once they see our purple brand multiple times. They will just know its us. At Jamison Lawn Care, that is exactly what we want our customers to feel like they’re being treated like! We are here to serve you because we are a service oriented business. You should absolutely be treated with the best customer service experience. There is so much creativity to be had with a landscaping company. We want to encourage creative thoughts because it will help us create a beautiful landscape for you. Not only will it help us achieve a pretty landscape, creativity will help give us a clear idea if you have some new thoughts for your property. Admit it, the purple is a one of a kind brand color you can instantly recognize. It creates a friendly atmosphere because it is not a harsh color. Neighbors feel confident walking up to our crew members because the purple color instantly makes them feel welcome! It doesn’t just stop with the t-shirts and logo. We have a top secret plan how to begin taking over with our purple brand! We are here to assist you in getting the most out of your budget. “What does your budget look like”? Believe it or not, this question should be discussed. Even if it feels awkward to discuss a budget, it needs to be done. Why should my budget be discussed? Because landscaping projects vary in size tremendously. In order for us to provide the best valued quote, we need honest information for you about how much you would like to spend. If you don’t know what the project usually prices out at we can give you a range. Because It begins with communication. Since we are not mind readers, we don’t know what your landscape goals are unless you tell us! It is critical that from the time you meet with us at your property you begin to tell us what your needs are! For example, here are some questions to think about: How many plants would you like installed, how much would you like to spend on plant installation, do you need hardscaping, if so, what do you want to keep the price around? Do you only want the front of the house landscaped instead of front and back, do you want low maintenance plants, do you want a full 3 inches of mulch or just a topdressing? Do you want a instant curb appeal or want to take on the project into bite size pieces overtime? Because we want to make this as hassle-free as possible. Imagine if you went into a process and had a $5,000 budget but a $15,000 expectation. It would create unnecessary aggravation and plenty of confusion. We don’t want you to get your hopes up and then be disappointed if the final completion is not what you expected. If you let us know your upfront budget, we can tell you if it’s realistic of not right away. Because we are here to help you. We talk openly about your budget early on to get a feel for what is a priority in your yard and what is not. Of course we can make your landscape into a magical garden wonderland, but we understand not everybody wants that or needs that. At Jamison Lawn Care we want everyone in Bucks County, Pennsylvania to get the best bang for their buck! We are here to achieve that! What can I do to my landscape in August? Great question! You can stay busy landscaping in August that is for sure. Especially in Bucks County, Pennsylvania. Get a plan in place. Whether it is gathering the family together for a fall clean-up event or hiring a landscaper. The leaves will be falling before we know it. If the weather isn’t too blazing hot you can plant the trees, shrubs or perennials that you wanted. Be sure to check the soil frequently so that the newly planted item doesn’t dry out! Get the soil tested to be sure that the newly installed plants will have the right soil to thrive in. This will make your landscape look in tip top shape and also prevent weeds. This will make the property look crisp and clean and encourage healthy plant growth for the following year! If the soil is moist that is the best time to weed. The weeds will pull out much easier if wet than dry. Make sure to remove all the water so that mosquitoes don’t start to breed. What is your favorite thing to do in your landscape during August? Let us know in the comments below! What Should I Look For In a Landscaper? Jamison Lawn Care of Jamison, PA joins ranks with Project EverGreen’s GreenCare for Troops program, a program designed to provide lawn care and landscape services to families of currently deployed military personnel as well as post 9/11 service-connected wounded/disabled veterans at no charge. Jamison Lawn Care will participate with lawn care and landscape professionals from across the country that donate their services and time to ease the burden on military families or disabled and wounded veterans needing assistance with services. GreenCare for Troops was launched in 2007 and since its inception more than 10,000 military families and 4,000 lawn and landscape contractors have registered to receive or provide services. “With more than 160,000 active-duty U.S. military personnel deployed in 150 countries across the globe, and significant numbers of wounded and disabled veterans, the need to support the families of those holding down the home front is significant,” says Cindy Code, executive director of Project EverGreen. Jamison Lawn Care urges interested military families and qualifying disabled veterans to register for participation in the GreenCare for Troops program online at www.ProjectEverGreen.org or calling Ki Matsko at 888/611-2955 for additional information. Headquartered in Cleveland, Ohio, Project EverGreen (www.ProjectEvergreen.org) is a national nonprofit organization committed to informing the public about the positive effects of well-maintained green spaces, including lawns and landscapes, sports turf, golf courses, trees and parks. SnowCare for Troops is modeled after its successful sister program, GreenCare for Troops, which provides free lawn and landscape services to military families. Project EverGreen recently launched its Healthy Turf. Healthy Kids.™ initiative that revitalizes athletic fields so children have safer places to play. We spent HOW MUCH on a lawn mower? HOW MUCH ON A LAWN MOWER! Yes, we are purchased a new baby! The total price? $10,000… Yes ten thousand dollars for something that just cuts grass. BUT WHY? A higher efficiency means our costs actually go down. With saved labor costs by having a more efficient mower, we can provide even better value to our customers. We have a brand image to maintain. That includes what we look like on your property. Nobody wants a shirtless bum pushing a broken mower on their property for $50 a week. By having newer equipment and dress professionally, we look better, as do you for hiring us! So we can grow as a business. We truly appreciate how our customers back us throughout our success. With new equipment, we can expedite growth by being able to bid larger properties with more value and continue to satisfy our current contracts quickly. Being the scrupulous business owners we are, Tom spent a good part of the winter watching and researching each mower available. As a landscape contractor, we are opened to a whole new world of manufacturers of mowers. Some include, but not limited to, John Deere, Scag, Wright, Hustler, Toro, Bobcat, Gravely, Kubota, Exmark. Now imagine about 20 different mower options per each. It took a lot of research! Ok, Ok, tell us what the new mower is already! Our new baby is a John Deere Z920M, with a 48 inch deck and mulch on demand. Ah, mulch on demand, let’s make a number 5 for why we purchased this. Mulch on Demand- That means the mower deck mulches the grass instead shoot it out the side discharge. Big deal, right!? Yes, it is! That lowers more time consuming tasks like leaf blowing the clippings off the pavement. As before, us saving time means better value for you! Although chemical sprayers for weeds are convenient, they may be doing harm to your precious lawns. Chemical sprayers may do deadly harm to your lawn, pets and family. It is a risk you should not be taking. Please be sure to always read the chemicals that are hiding in your bottle of weed killer. Do research on those chemicals. If you find any that make you second guess that weed killer, ask yourself: Am I willing to take this risk? If not, then try our natural weed killer! Homemade! We encourage our customers to check out natural weed control. You can make your own at home, for cheap! No really, we are serious. Keep on reading curious one! Pour salt into spray bottle. Then add vinegar over top. Lastly, top it off with dish soap and mix. Spray in the morning and watch the weeds die! 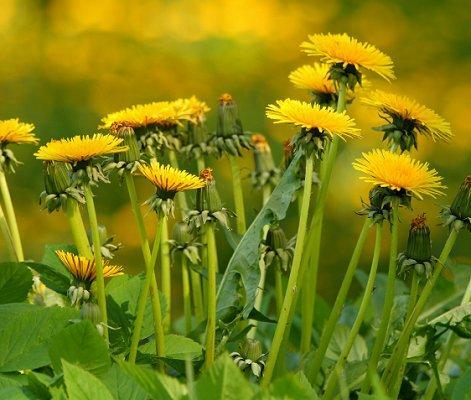 There other homemade weed killer is, well, not really something you can make because it is something you already have. Your hands! Yes, that’s correct. Pulling weeds directly from the root are more powerful towards smaller weeds. After a rain day the weeds will be easier to yank out because of the more wet soil. We suggest that as soon as you spot the weeds, pull them, because this will prevent further germination from spreading. If you find that the weeds keep popping up, try digging them up at the root with a garden trowel. We are annoyed with weeds as much as you are. Your property won’t ever be 100% weedless but it will be pretty darn close if you tackle the weeds with persistence! Don’t let them germinate! Please note this is only a couple ways to eliminate the weeds, Let us know how you get rid of those buggers! What do you suggest? We want to hear from you. Why Do We Wear Purple? Why is My Grass Brown?